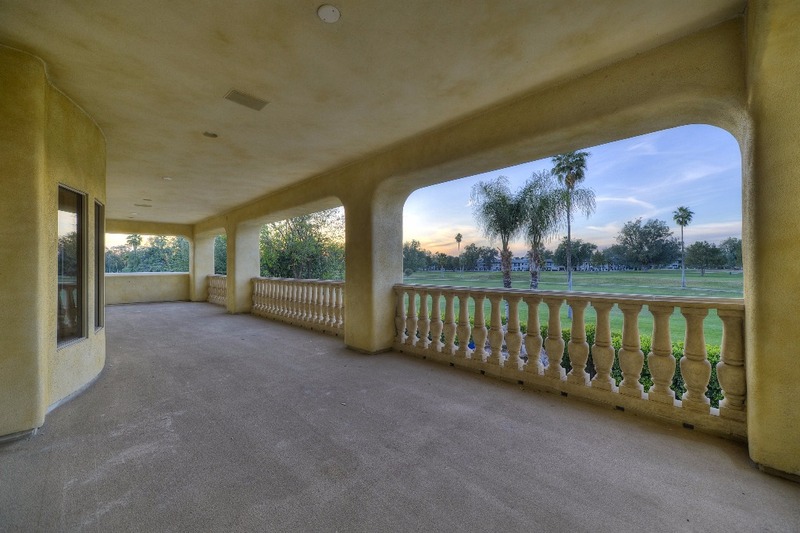 1,000 square ft stunning Master Suite is located on the Main floor overlooking the oasis backyard and golf course! 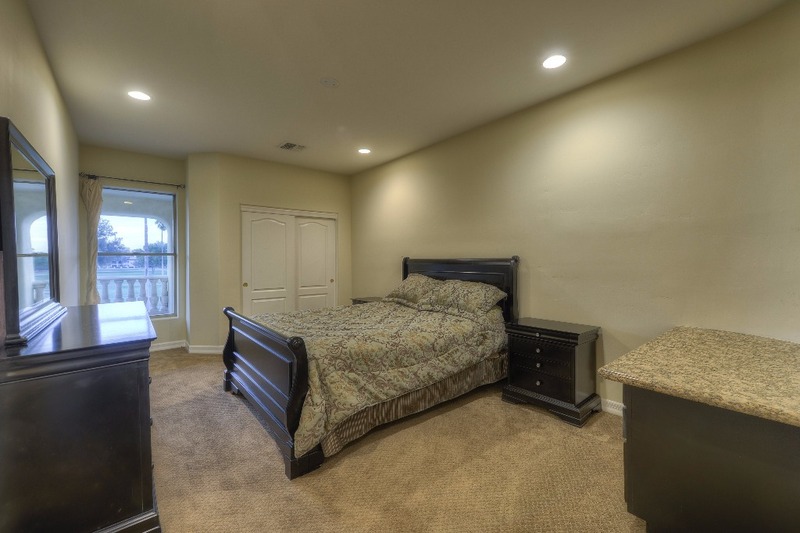 Master Bath includes separate his and her's area along with a walk in shower, Jacuzzi jet tub and large walk in master closet! Kitchen includes State of the Art Commercial Viking Appliances, huge family room and a breakfast area overlooking the Golf Course, back yard pool and Jacuzzi. 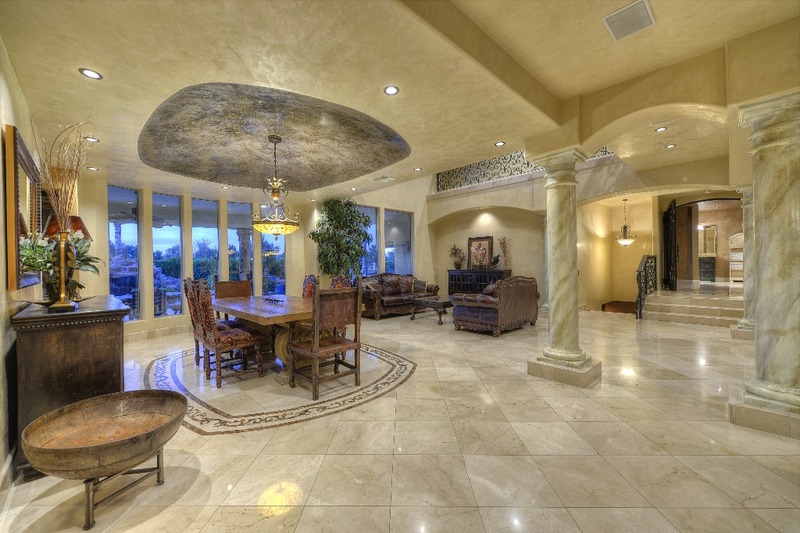 The Dining area and living room are also located on the Main floor. Steps away is a gorgeous bar and sink. 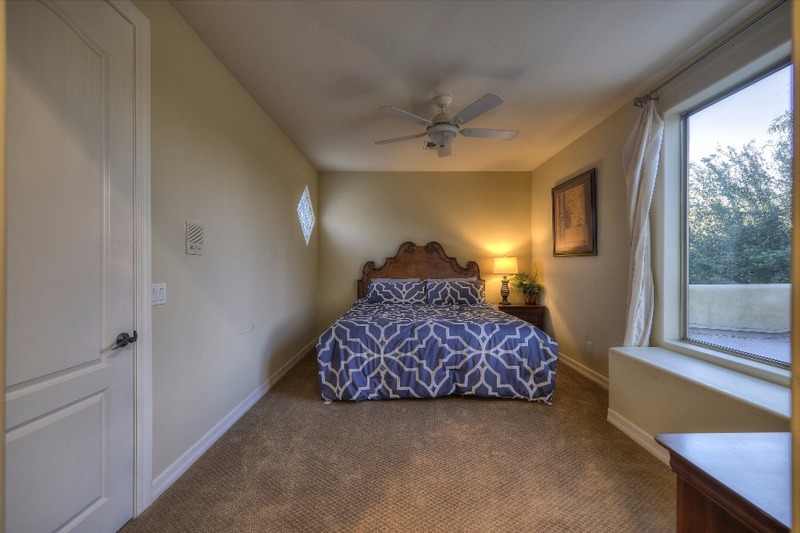 Large Laundry room equipped with front load washer and dryer on the main floor as well. 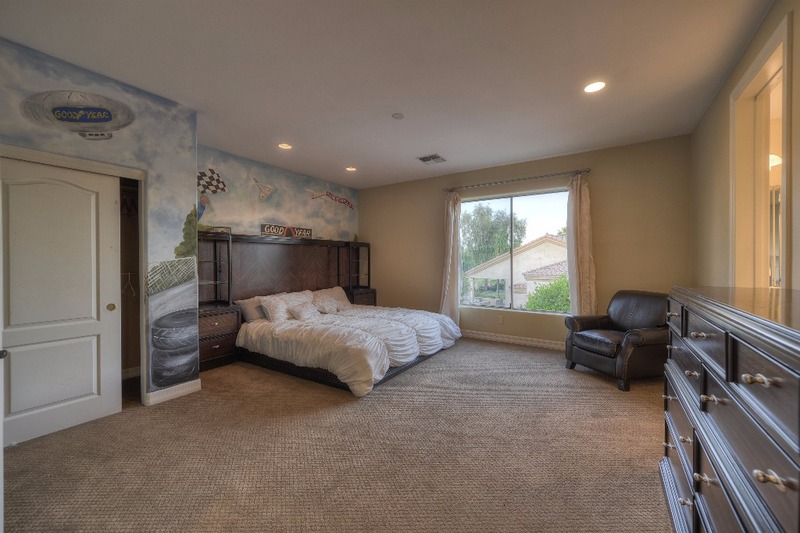 This AMAZING party room includes a State of the Art theater, billiards room, a full bar and stunning guest bedroom with queen bed and a full bathroom. 5 bedrooms! 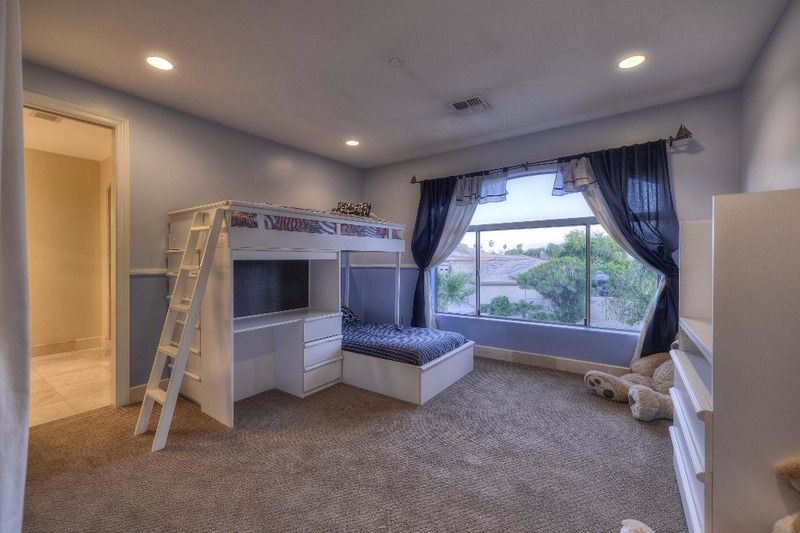 3 bedrooms featuring queen bedroom sets, 1 bedroom featuring a king bedroom set, and 1 bedroom includes a bunk bed set. 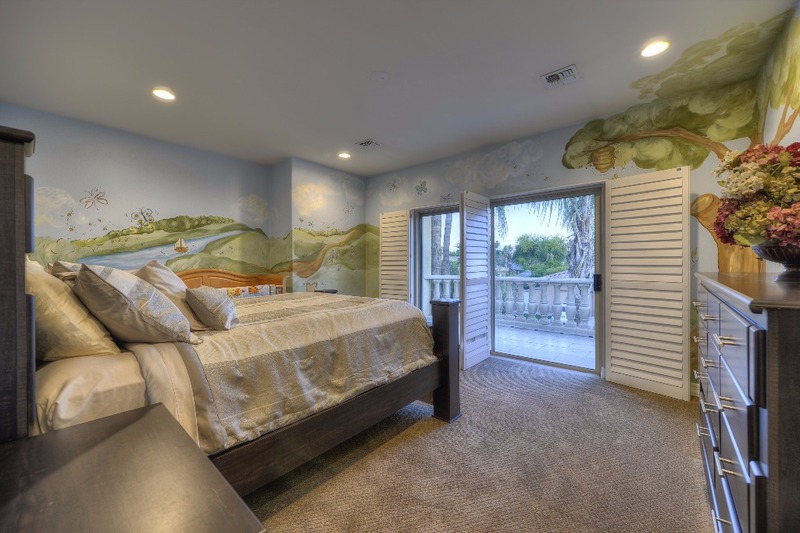 Home also has a crib set that can be located in one of the rooms, per guest request. 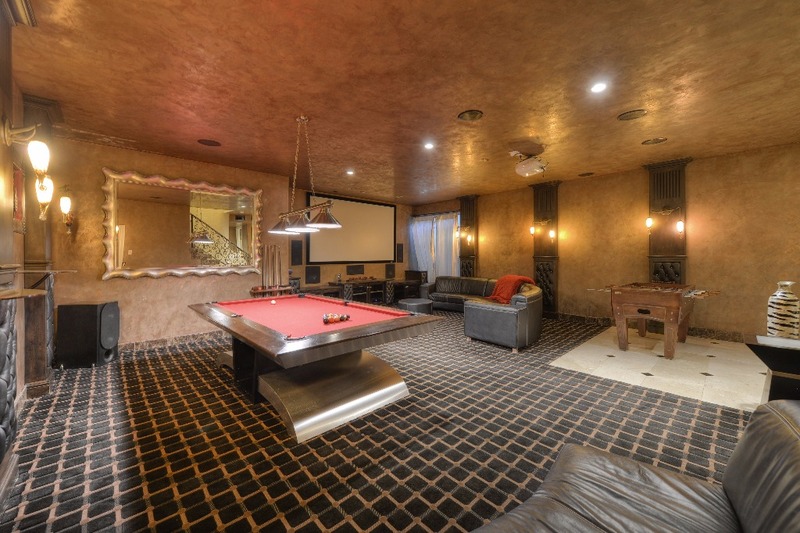 The top floor also includes a loft with a 55 inch plasma, couch and sofa, and gaming station for the kids! We encourage kids to bring additional games and their remotes. 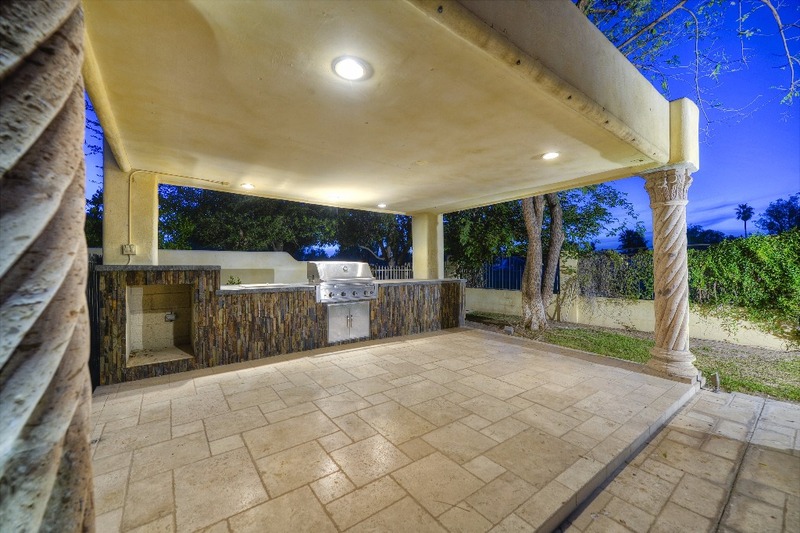 This Back Yard is complete paradise overlooking the San Marcos Golf Course, pool, Jacuzzi, rock waterfall/slide, huge Rainbow Play System for the kids, Barbecue area, and fire pit. 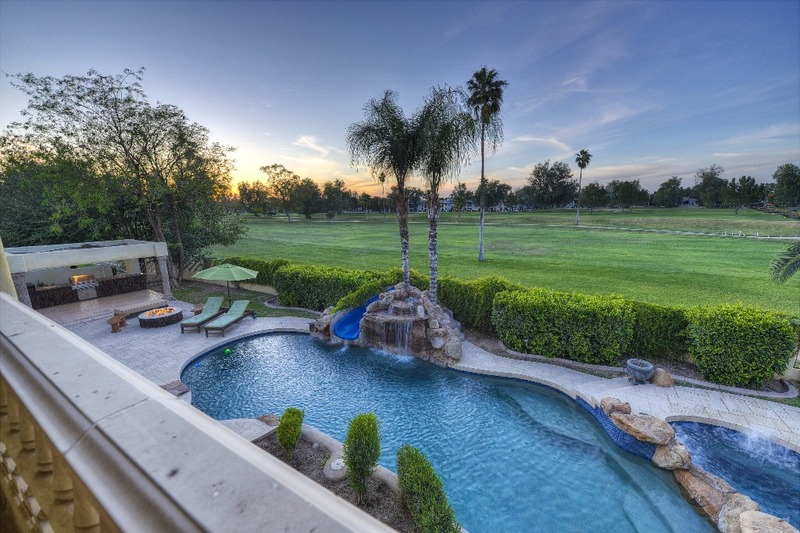 If you would like to have the pool heated, we can do that too! From October thru April, the cost is $100/day to keep the pool at 85 and $25 more per additional degree up to 89. From May - September, the cost is $50/day to keep the pool at 85 and $25 more per additional degree up to 89. 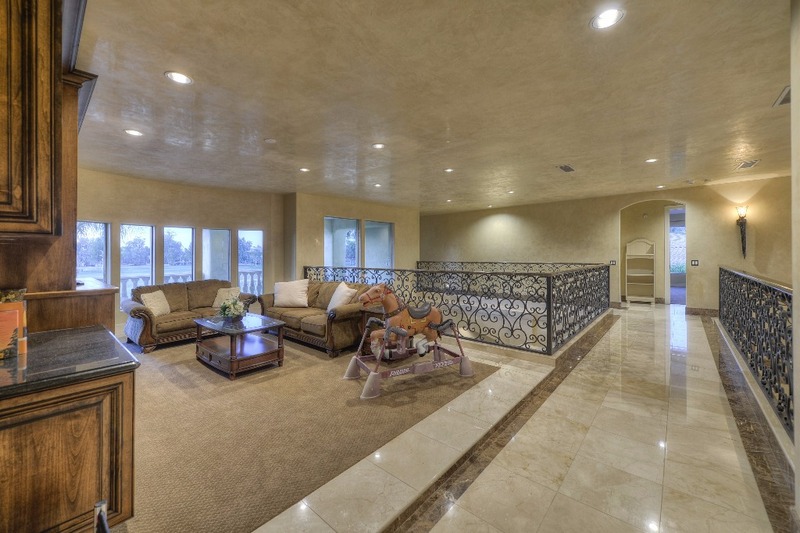 This House is situated inside a gated community and sits on the 11th hole of the San Marcos Golf Course. The San Marcos Golf Course boasts a recent multi-million dollar renovation and now includes a brand new state-of-the-art irrigation system that produces year-round premium playing condition, expanded lakes, new tee boxes, reconstructed bunkers with new sand, and green enlargements on a handful of holes. The result is a strategically-diverse and visually stunning layout that makes for an enjoyable challenge for golfers of all playing abilities. Sandwich Platters (hot and cold), Bakery items, fruit platters. Phone 480-855- 3212 cell phone - 480-855-3212 business. Hector also owns Downtown Chandler Café and Bakery which serves award winning breakfast and lunch! 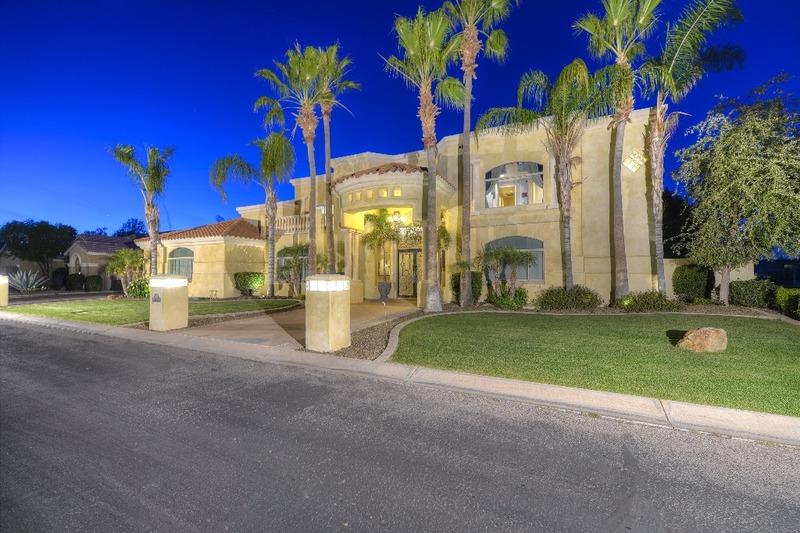 It is located walking distance from the home, in Downtown Chandler. Note: Chef is a 3rd party. 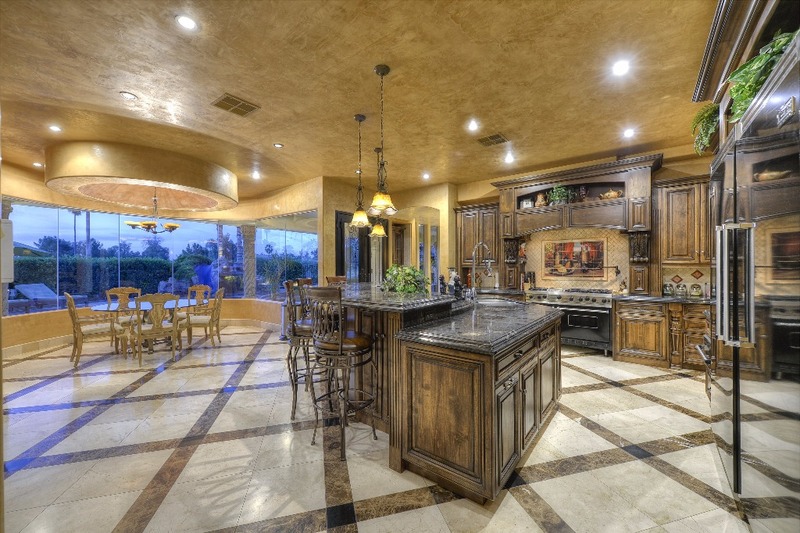 This house has it all!!!! CHECK-IN TIME is AFTER 4 PM AND CHECKOUT is 11 AM. NO Early Check-in or late checkout unless agreed to by owners. PETS are not permitted at or in the property under any conditions. DAMAGE DEPOSIT - A damage deposit of $500 is required. This must be received at time of booking the reservation. The deposit is NOT applied toward rent; however, it is fully refundable within 7 days of departure, provided the following provisions are met. All keys remotes are left on the kitchen table and unit is left locked. No linens or other property are lost or damaged. The renter is not evicted by the owner (or representative of the owner), the local law enforcement, or the security company employed by My Community. PAYMENT – An advance payment equal to 100% of the rental rate is required at the time of reservation. The advance payment will be applied toward the rent. Please make payments via credit card or checks payable to Shawn and Michelle Poe. The advance payment is not a damage deposit, except when the damage deposit is included in the total amount paid. In this instance, the damage deposit amount paid will be held separately from the all other amounts owed. CANCELLATIONS - A sixty (60) day notice is required for cancellation. Cancellations that are made more than sixty (60) days prior to the arrival date will incur no penalty. Cancellations or changes that result in a shortened stay, that are made within 60 days of the arrival date, forfeit the full advance payment and reservation deposit. Cancellation or early departure does not warrant any refund of rent. MAXIMUM OCCUPANCY – The maximum number of guests is limited to 15 persons. MINIMUM STAY – This property requires a 2 night minimum stay. Longer minimum stays may be required during holiday periods. If a rental is taken for less than 2 days, the guest will be charged the two-night rate. NO DAILY HOUSEKEEPING SERVICE – While linens and bath towels are included in the property, daily maid service is not included in the rental rate. However, it is available at an additional rate. We do not permit bath towels or linens to be taken from the units, but we provide extra beach towels for your use. RATE CHANGES – Rates subject to change without notice. PARKING – Parking is limited to 7 vehicles. Vehicles are to be parked in designated parking areas only. Parking on the road is not permitted. Any illegally parked cars are subject to towing; applicable fines/towing fees are the sole responsibility of the vehicle owner. 3 cars may be parked in the garage and an additional 4 cars can be parked in the driveway. No street parking is allowed at any time. HOT TUB – No children under the age of 12 permitted in hot tubs at any time. When using the hot tub, remember there is a certain health risk associated with this facility. Use at your own risk. The hot tub is maintained prior to your arrival. Since the heating of the hot tub can not happen at the same time of the pool being heated, there can be an hour to an hour and a half of heating prior to hot tub reaching 102 degrees. WATER AND PLUMBING – DO NOT FLUSH anything other than toilet paper. No feminine products should be flushed at anytime. If it is found that any object other than toilet paper have been flushed and clog the system, you could be charged all damages for repair. A "mandatory evacuation order has been given” in the area of residence of a vacationing guest. Any advance rents collected or deposited for a reservation that is scheduled to arrive during the evacuation period. TRAVEL INSURANCE – We highly recommend all guests purchase travel insurance. All payments for this reservation should be made directly to 112 Quarty, LLC. Please sign and return this page and each page of the rental rules outlined below. As soon as I receive payment and signed agreement, We will send final confirmation of stay. Please list below all guests who will occupy the property. ALL guests must be pre-registered. If the list of guests changes, the owners must be notified immediately of the change. Additional guests not on this list or unauthorized guests found at the residence during the stay will immediately void this agreement and all guests will be required to vacate the property at the own costs immediately. No refunds of an monies already paid will be returned for any breach of this agreement. This property is privately owned; the owners are not responsible for any accidents, injuries or illness that occurs while on the premises or its facilities. The Homeowners are not responsible for the loss of personal belongings or valuables of the guest. By accepting this reservation, it is agreed that all guests are expressly assuming the risk of any harm arising from their use of the premises or others whom they invite to use the premise. I hereby give permission to charge my credit card for the amounts above. I agree that all rental monies are non-refundable per cancellation policy above. I have read my rights to purchase travel insurance. By Signing Below, I agree to all terms and conditions of this agreement. This Swimming Pool and Hot Tub Addendum is attached to and becomes a part of the Rental and Agreement on the property referenced above. It is the Tenant’s responsibility to read and understand the following waiver and release, and the Tenant should consult their attorney if they do not fully understand the implications of signing this waiver and release. The subject property has a swimming pool and hot tub located thereon. The tenant(s) and their guests will use the swimming pool and/or hot tub at their own risk. Swimming and/or the use of the swimming pool and hot tub carry inherent dangers, and tenant(s) and their guests assume the risk of these dangers by using the swimming pool and hot tub. The owner will not be held responsible for any injuries or deaths sustained by the tenant and/or the tenant’s occupants or guests when using the swimming pool and/or hot tub, and the tenant will indemnify the owner for any actions resulting from injuries to or death of tenant and/or tenant’s occupants or guests. Tenant(s) hereby waives and releases any and all claims against owner relating to the use of the swimming pool or hot tub by tenant or their guests. The tenant is responsible for keeping all gates locked and the swimming pool/hot tub area secured at all times. The tenant understands and agrees to allow the owner, and any workers employees by the owner, access at regular times to maintain the pool equipment. The tenant agrees to refrain from attempting to make any repairs or adjustments to the pool equipment or to any of the electrical wiring for the pool equipment. The tenant must immediately notify the landlord of any repair that the swimming pool/hot tub may require. The tenant is responsible for the full cost that may be due for repair and/or replacement of the swimming pool/hot tub to the extent that such repair and/or replacement is necessary as a result of actions or inaction by the tenant or the tenant’s occupants or guests. The tenant must operate the swimming pool/hot tub in accordance with the manufacturer’s instructions and in a safe, responsible manner. No pets of any kind are permitted in the swimming pool and/or hot tub at any time. Children under the age of 12 or any person lacking the physical ability and/or experience to comfortably swim without danger of injury shall be supervised by a capable adult at all times. The tenant understands that the swimming pool and/or hot tub is strictly an amenity and that the use of this amenity is NOT guaranteed under the terms of the lease. Any interruption or non-availability of the use of the swimming pool/hot tub will not violate any terms of the lease. If the tenant violates any part of this Addendum, the tenant will then be in default of the agreement. In the event of a default, the owner may evict or have the tenant removed from the premises, as well as seek judgment against the tenant for any monies owed to the owner as a result of the tenant’s default. The swimming pool and hot tub have a heating system in place. Use of the heater to heat the hot tub is included in the base rental fee when used responsibly (i.e., running the heater only when the hot tub is use, and turning the heat off when not in use). Use of the heater to heat the swimming pool requires payment of an additional heating fee, as there is a substantial expense associated with heating over 35,000 gallons of water. It is unfortunately very common for swimming pool heaters to break down and require repairs. Such issues are beyond the control of owner, and do not entitle tenant to a refund of any portion of the rental fee other than any additional heating fees relating to the period when the heater is inoperable.